The first stalemate of the tournament, for a circumstance where both sides were content with leaving as they started. With France’s spot in the Round of 16 already secured, Deschamps rested key starters such as Mbappe, Pogba, and Umtiti. With Australia’s match against Peru taking place simultaneously, the Danish needed to be in tune with the results of that match in case the Socceroos were close to advancing. This circumstance found in chess aptly describes the entirety of the ninety minutes, where making no move was most beneficial to each team. Unlike chess however, each team is not compelled to take any genuine risks, so the disadvantages that come with being in zugzwang were not to be found. A draw was the preferred result for both teams. If France lost, they lose their top slot in the group. If Denmark loses, they subject themselves to possible elimination if Australia get the needed results. Therefore a draw kept both teams happy, with the possible undertones of Denmark looking to avoid a matchup against Argentina in the Round of 16 if Messi’s men managed to make it through. Each team was organized with a defensive focus, or at least a protectionist one. France adjusted their selection to reflect this intention. Steven N’Zonzi replaced Pogba, while Sibide and Kimpembe took the spots of Pavard and Umtiti for rest. The starting of Thomas Lemar and Dembele looked promising from an attacking perspective, only for it to be implemented with lost potential. Denmark used a 4-1-4-1 system, with Chelsea’s Andreas Christensen, traditionally a centre back, playing as the 6 in between the lines of four. The only incentives for Denmark to impose themselves onto the match were based off the score of the Australia match. Australia required a win to be in contention, with Denmark having to lose as well before goal difference comes into effect. With Peru taking a lead midway through the first half, Denmark applied the brakes and appeared more comfortable in the match. 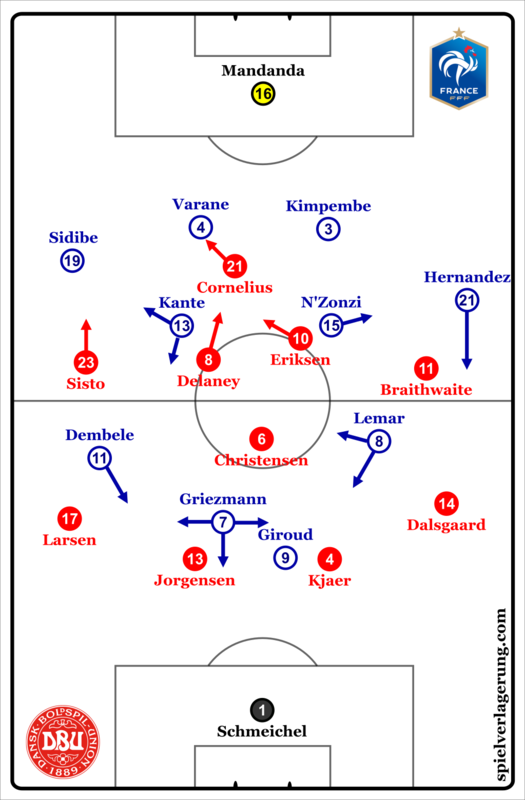 France had the majority of possession in this match, as Denmark gladly retreated into a 4-1-4-1-0 deep block. Little to no pressure was applied to the ball carrier during France’s build up. With the defensive midfield duo joining the defensive line, France had a large presence in the first line of attacks for possession. Hernandez. The Atletico left back advanced on the left wing, Lemar correspondingly pinching inside. Griezmann continued his free role that has been implemented throughout the last few matches. However, he dropped deeper than he typically had in the past two matches for two reasons. First, Kante and N’Zonzi were not willing to play into Griezmann into the tight spaces ahead of them when in the early phases of possession. Therefore, Griezmann had to move into lower lines to get a hold of the ball. Dembele or Lemar received the ensuing passes, but Griezmann was also conservative in his choices. The bright points in this match for both teams were fleeting. From the French standpoint, combination play with Thomas Lemar alongside the left halfspace had encouraging potential, yet a mixture of inadequate technical execution and tight space near the goal had none of these instances pan out. Giroud’s play as a target led to similarly promising spells, but to no avail as any shots that were taken hardly concerned Schmeichel. 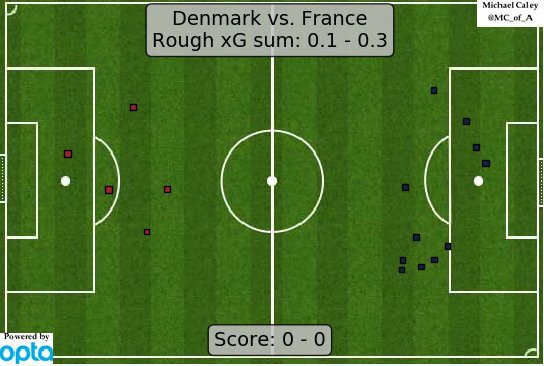 French counterattacks after set pieces and lengthy Danish possession sequences also had some prospect of adding a goal to the match. Yet these were snuffed out either through tactical fouls or errors in technical execution. Denmark’s attack was largely primed around Andreas Cornelius, who functioned as a similar sort of target man to Giroud. With Eriksen and Delaney playing off of him, they had glimpses at goal, none of which caused too much stress for Steve Mandanda. The second half substitutions for both teams aimed to get match fitness for potential impact players for both teams as they went into the knockout rounds. Benjamin Mendy played just under a half at his traditional left back spot, and Nabil Fekir joined later on in place of Griezmann. Fekir was the only player who showed any real aspiration toward scoring, hitting a couple of speculative distance shots that veered just wide. Mbappe got a brief run out for the last fifteen minutes to ensure he didn’t lose much sharpness. For Denmark, Pione Sisto and Cornelius were replaced by Viktor Fischer and Kasper Dolberg, each of whom are hoping to rediscover their top form during the tournament given their respective recent difficulties. Both teams provided little to observe besides contentment in their current state. Players wallowed around the pitch, hoping to avoid injury as both teams prepare for more important fixtures ahead. The first games of the day saw Group C come to its conclusion, with Australia hanging onto the slightest glimmer of hope of making it through to the Round of 16. As was the case in the first matchday in the group, the Peru game was a cheerful affair, with many wholly pleasant scenes and strong left-sided dynamics. These, however, came mainly from the Aussies. Australia under Bert van Marwijk have managed to combine strong organisation with some of the tactically ambitious aspects instilled by the man who got them to Russia, Ange Postecoglou. Building up from the 4-2-3-1 the Dutchman has implemented, the flank focus in the final third remains, as do some of the structural issues, even if the approach is more pragmatic. Their early play in the face of high pressing was low-risk. The front three often drew narrow, occupying the Peruvian backline with a mixture of runs into depth and movements off the front line. Matthew Leckie was the target in the early stages for direct balls into depth on the right flank, into the space left behind as Peru would push up together to press. However, more than just offering for long balls, Australia’s depth-running in their forward line served to assist the controlled build-up play, championed by Postecoglou. With Peru’s defence having to drop early to avoid being caught out by the pace of Leckie and Kruse in behind, space emerged either side of Tapia in their 4-3-2-1 defensive structure. Australia sought to fill these spaces with Juric off the front line, with Tom Rogic, and latterly with Leckie. Though the Celtic star, Rogic, acted predominantly at the far ends of the halfspaces – much like he does for his club – he found more success than the two forwards. Forays from Juric or Leckie into the space between lines lacked the coordination or appropriate dynamic to be effective beyond simple interplay, while Robbie Kruse might have been effective there, but his prevailing movements took him more often to the defensive line or the left flank. Getting the ball to these spaces was not a problem. Despite their relatively low standing in world football, there are a great number of countries who would love to be able to call upon the build-up players available to Australia. If positional build-up play is the crown of Australia’s game, then in Trent Sainsbury, Aaron Mooy, and Tom Rogic, they have three glistening gems. Sainsbury’s ability to find or create an angle for a pass, then use that pass to put his teammates in advantageous positions is at an incredibly high level. Using this ability, he found Tom Rogic in dangerous areas repeatedly, both in the right and left halfspaces, as well as supplying Aaron Moy with delicious orientation-busting flat diagonal passes. Even with one of the most playful deep build-up units in the tournament, Australia had a somewhat ineffective circulation game at times. In many phases, Mooy and Jedinak suffered from weak spacing and almost non-existent staggering at the base of midfield, greatly limiting their potential for receiving and progressing the ball. Furthermore, this led to possession being stuck on the flank with even the slightest Peruvian pressure. 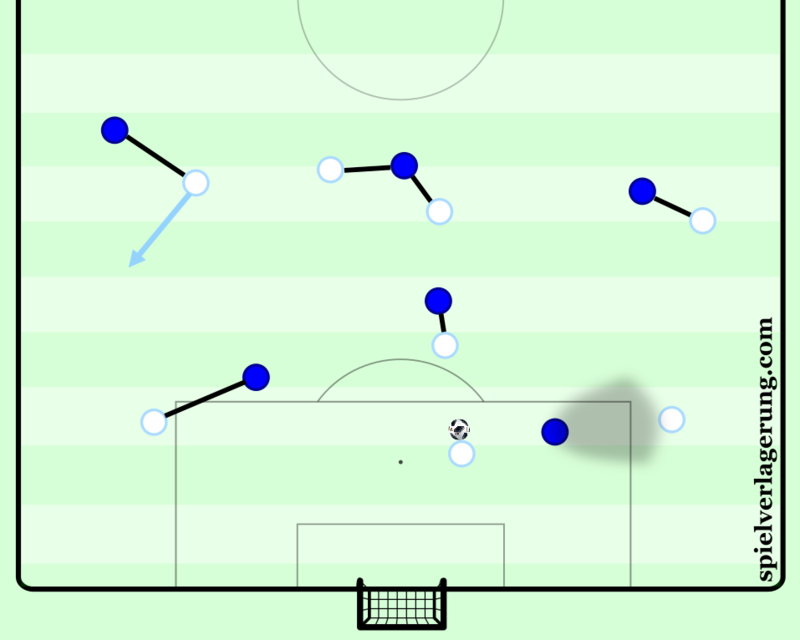 While left centre back Mark Milligan would attempt to resolve these situations on the left with rapid changes of rhythm through flat, vertical passes, the right side saw unprepared long balls down the line to escape, with even less success. Peru continued to show signs of their playful style in their final game, but without the same effect as in their previous matches. Their left sided combinations and play between the lines that they exhibited so well against Denmark, failed to puncture through the Australian defensive structure as often. Bert van Marwijk’s side defended compactly in their 4-4-2, with Jedinak and Mooy tilting strongly to prevent Peru from creating small overloads. Often lacking presence high in the centre or right halfspace, there was no threat for the Australian central midfielders to worry about leaving behind. 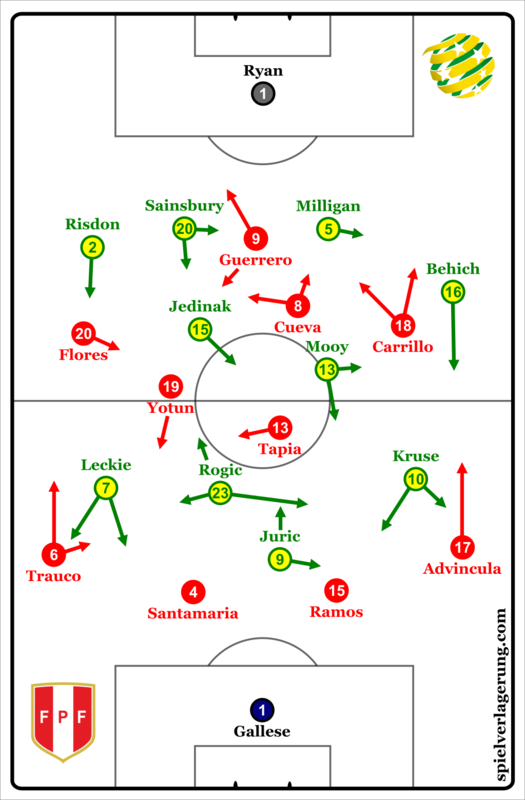 Furthermore, the quick switches after combinations that gave Carrillo and both fullbacks so much space against Denmark were easily defended, with the players on Australia’s far side able to maintain immediate access due to the lack of central threat. The compactness between lines that Peru faced also limited the types of combination that they could break through with. Since Guerrero was not as active as the injured Jefferson Farfan as a focal point for combinations, finding him immediately with flat passes then using quick combinations to keep the ball in advanced areas was already less viable. In those tight spaces, with many Australians having access to press, the likelihood of stringing together any number of passes at the speed and precision necessary to keep or progress possession was low. This resulted in mainly small-scale actions on the left side. Using fewer passes to bridge the same distances led to chipped balls into depth which the Aussie back line dealt with easily, while flat passes were often too long and therefore easily cut out. Longer passes altered the dynamic of Peru’s play, as support for the receiving player was less readily available, leading to slower play and ultimately crowding out. Far more fruitful were quick wall passes for deep runners, utilising basic coordination whilst minimising the time the ball spent in danger. Nigeria faced Argentina to decide who will join Croatia in the knockout stages from Group D. Unless Iceland beat Croatia by 2+ goals, Argentina needed to win to qualify, whilst a draw would be enough for Nigeria. Argentina made a number of changes from their 3-0 loss to Croatia, with Armani, Rojo, Banega, Di Maria and Higuain all coming into the line-up, whilst Nigeria fielded the same team that beat Iceland 2-0. Nigeria played in the same 3-5-2 shape they used to beat Argentina 4-2 last year (although Messi didn’t play on that occasion), meaning their confidence was high coming into this match. Argentina looked better in the opening stages of this match than they have done in all of the World Cup so far. Their base shape was a slightly lopsided 4-4-1-1/4-4-2. This was because Higuain played in a more attacking position compared to Messi on the right, whilst Perez tended to tuck in to the centre from the right wing, whereas Di Maria was playing in a wider position on the left. In possession, Argentina had a slightly higher defensive line height than they used in their previous two games, perhaps approaching opposing counter-attacks more cautiously, the source of Nigeria’s best chances and goals in their 4-2 win against Argentina last November. Mascherano was the #6, operating between Perez and Banega, and seldom Otamendi and Rojo in the defensive line. However, his passing was poor, in addition to his limited mobility at the tender age of 34, resulting in a few turnovers of possession. He sometimes stepped out of Argentina’s midfield to press Nigeria’s #6, which was aggressive yet well-timed, exhibiting his surviving defensive ability. He should have been used as a defender, giving him greater defensive but less passing responsibility. Solidifying Argentina’s defence, and making them more proficient at retaining possession. Banega was rarely deeper than Mascherano during Argentina’s build-up, usually in a 2-3-2-3 shape, instead using his superb technical skill from the left half-space. As mentioned in my preview of Argentina prior to the World Cup, Banega’s positional intelligence, passing ability and ball retention are truly top class, and make a huge difference to Argentina’s attacking capability. Why Sampaoli chose to leave him on the bench in their matches against Iceland and Croatia really does baffle me, in my opinion he is Argentina’s most important midfielder. Banega consistently found space between Nigeria’s defensive line and midfield trio in the left half-space. He was on the same wavelength as Messi, possessing a good understanding of Messi’s off-ball movement patterns, and where he was likely to appear in and around the right half-space and behind Nigeria’s midfield. He looked sharper in this match than he has done at the World Cup so far. Messi’s movement and Banega’s understanding of it also facilitated space for other teammates to receive passes from Banega, as the example below shows. Banega drops from the left #8 position to receive the ball from Nigeria’s defenders to help progress into Nigeria’s half. Messi’s movement from the right half-space to the centre of the pitch attracts the attention of Nigeria’s left outside centre-back, meaning he follows Messi towards the centre of the pitch. Perez moves into the position Messi was just in, and as a result of Messi’s movement and occupation of the defence’s attention, Perez has more space between Nigeria’s lines to receive an accurate pass from Banega. Banega had the diagonal passing ability to find Messi (as his assist for Messi’s goal proved) usually through diagonal passes. On the occasions that Messi dropped into central midfield to aid Argentina’s build-up, Banega was often Messi’s primary passing target in the left half-space. The attraction of the defence towards Messi meant that Banega was in more space than he would have been if another Argentinian player was on the ball, and he could receive passes from Messi to progress Argentina’s attacks. Messi’s usual positioning in the right half-space meant that Higuain was slightly left-orientated. He tended to be met with the defence collapsing on him when receiving the ball in attacking areas, which was okay as he could pass back to Banega/Mascherano to recycle possession and attacks. Martin Rafelt’s brilliant ‘How To Messi’ article is a must-read if you would like much more detail on such topics. Particularly towards the start of the match, Messi moved into the right-wing position. When he moved inside, Higuain would do one of two things. Either move to his usual left-orientated forward position, or move in the opposite direction to Messi towards the right-wing if Di Maria was in the left half-space/forward position. Di Maria was more of an inside-forward compared to his usual out-and-out winger role, with Tagliafico in the wing channel instead. Rojo would move into a wider defensive position, permitting Tagliafico to advance. Occasionally however, Tagliafico would make underlapping runs beyond Di Maria through the left half-space when Di Maria was on the left wing, which was a nice way of overloading Nigeria’s defensive line and adding an element of unpredictability to Argentina’s attacks. When Di Maria was in the forward position along with Higuain, Argentina had much better last line occupation in comparison to their first two matches against Iceland and Croatia where it was usually just Aguero. This facilitated a greater amount of space in front of Nigeria’s defence for Messi to operate in. Nigeria’s greatest threat to Argentina came in attacking transition. The dropping movements from their strikers, usually Iheanacho, and pace possessed by Musa caused Argentina’s centre-backs some positional issues. When they dropped away from Argentina’s defensive line, Otamendi and Rojo were forced to follow them and step out, but Musa and Iheanacho were not allowed to turn because of the pressure provided by Argentina’s centre-backs, and were instead forced to pass back to the midfielders. The Nigerian forwards tended to be quite isolated, making the progression of attacks difficult, and often leading to possessional turnovers. This was also the case when Etebo had the ball (usually Nigeria’s most advanced midfielder), despite his strong ball retention. Nigeria’s midfielders were physically stronger than Argentina’s, which was also a problem for Argentina in their 4-2 loss to Nigeria last year. Despite this allowing Nigeria to regain possession in the middle phases of the pitch on numerous occasions, they commonly couldn’t progress through Argentina’s midfield and were forced to play long passes towards the forwards. Another reoccurring problem from their 4-2 loss to Nigeria that Argentina faced in this match was the African side’s man-orientations to Argentina’s players during their build-up from Armani in goal. 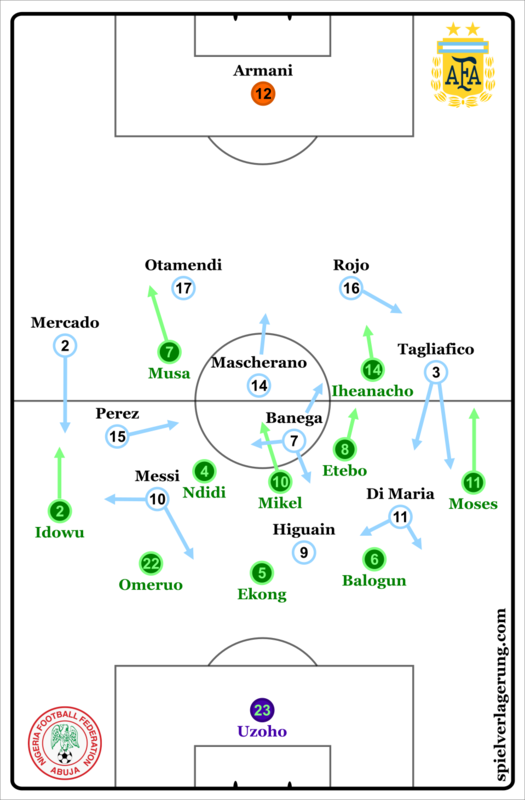 Similar pressing scenarios from their last encounter in this match forced Armani into long passes because Argentina’s build-up structure wasn’t sufficient enough to play through Nigeria’s man-orientations. Instead, Argentina opted to take long goal kicks to try and win second balls further up the pitch. The limited attempt to play out from defence perhaps again highlights Argentina’s more cautious approach against Nigeria following their loss to them last November. Argentina struggled to play out from the goalkeeper against Nigeria last November in a match they ended up losing 4-2. Nigeria were revitalised for the spell of the match following their equalising goal. The penalty (occurring after a mindless foul by Mascherano from a corner) gave the Nigerians extra energy, and they had better occupation inside Argentina’s half of the pitch. Sampaoli had to make changes to score the goal that would take Argentina through to the last-sixteen. Pavon came on for Perez soon after Nigeria’s goal. Pavon is another player in addition to Banega that should have played more than he has, being one of Argentina’s brightest players at the World Cup so far. It bewilders me as to why Sampaoli hasn’t picked him in the starting line-up for any of Argentina’s group matches. Argentina’s shape wasn’t as lop-sided with Pavon as the right-winger because of Perez’s tendency to tuck into central midfield when he was on the right-wing. Not only did Pavon’s runs in behind Nigeria’s defence add a different dynamic to Argentina’s attacks, but they also had greater occupation of Nigeria’s five-man defensive line when Pavon, Messi, Higuain and Di Maria constituted Argentina’s forward line. Nevertheless, Higuain offered little to Argentina’s attack, moving lethargically for the majority of the match. Di Maria has been less influential and effective for Argentina at the World Cup compared to other matches under Sampaoli, whilst Meza played poorly after being substituted on. This collective struggle meant that Argentina laboured when trying to find the required goal to qualify for the last-sixteen. It was almost too congested in the middle of the pitch after Argentina’s forward-minded substitutions. Because Argentina had to throw players forward in an attempt to score, whereas Nigeria were through to the last-sixteen with a draw, there were large amounts of space for Musa and Ighalo to exploit when Argentina lost the ball, and were subsequently unorganised in defensive transition. Argentina were extremely exposed as the match went on, and were reliant on the individual quality of their defenders to bail them out, which was part of the reason they lost against Nigeria the last time they played, where they found it very difficult to defend Nigeria’s counter-attacks. Nigeria had a couple of big chances in attacking transition where Argentina were vulnerable, but they lacked the composure to finish them and confirm their place in the last-sixteen. A crazy Marcus Rojo goal won Argentina the match, sending Argentina through to the knockout stages, and Nigeria home after being minutes away from qualifying themselves. Argentina will play France in the last-sixteen in what is a mouth-watering match-up. The odds are against them, but France also haven’t lived up to expectations in their performances so far, despite achieving better results than Argentina. It is a match Argentina are capable of winning Sampaoli picks a good team and they play well. Pavon and Banega should be included after excelling in their appearances at the World Cup thus far. France’s greatest strength is their attacking transitions. Will Argentina use an appropriate structure in possession that limits France’s counter-attacking ability, or will their reliance on individual defensive quality be their downfall? Let’s hope Messi and co. can build from their performances so far and take the game to France on Saturday.